So you come to the factory where you work. You sit down at your station, the beginning of an eight-hour shift. And that's when the family of four walks by, pointing and talking about your workstation. They have tons of questions. They're touching everything. And suddenly you're behind and your friend further down the line is now waiting on you impatiently. He can't work because you can't work. Welcome to the LEGO factory in 1967. 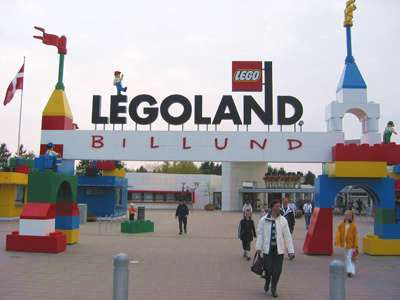 The toy company in Billund, Denmark, found that production was being slowed by people wanting to (understandably) visit the factory. And so the LEGO Group opened the first LEGOLAND theme park, not a 10-minute walk from the factory, the following year in an attempt to give tourists something to do other than disrupt the line at the factory. Today (with a hat tip to Dave Banks at Wired's Geekdad) is the 42nd anniversary of that park's opening. There are now theme parks in Germany, England, and the United States (Carlsbad, California) with parks slated to open in Dubai and Winter Haven, Florida, over the next two years. LEGOLAND helped me to triple the number of roller coasters I've ever ridden in my life (to a whopping three) -- although, I'll admit it didn't hurt that the roller coasters are designed for the scare quotient of a 10-year-old.